Recycling has long been the low-hanging fruit of sustainability in both neighborhoods and offices. More municipalities and office buildings have recycling programs and for the consumer, pitching those cereal boxes, bottles and cans are even easier than before. Single-stream or "commingled" recycling programs make it even easier for us: the days of separate and clunky bins of paper, metal and glass are no longer the norm. If you are a recycling fiend like me, the amount of garbage you pitch on a weekly basis probably fills an average sized plastic bag from the local supermarket. 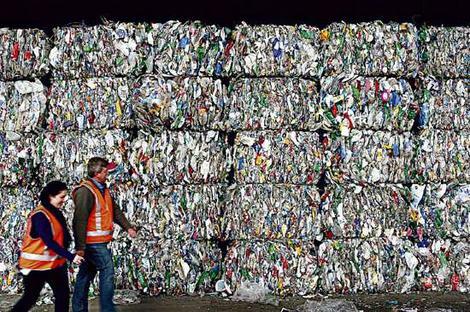 Advocates for green jobs tout recycling as a job opportunity for those seeking employment. But while recycling is easy for consumers, the job of those who sort those materials at a site far away from our homes and offices is dangerous, dirty and often pays a marginal wage. More cities allow just about everything to be plunked in the recycling bin, from Tetra-Pak boxes to CFL bulbs to food scraps. But someone has to separate all those items, and if you have those acid reflex moments when you haul your cans away or walk up to your apartment’s dumpster once a week, imagine what it is like for a recycling worker day in and day out. Last year, a Forbes article quoted sanitation and recycling workers as having the 7th most dangerous job in the country, with 25 deaths per 100,000 workers. Jean Tepperman's article in the East Bay Express explains the long-term harm that recycling workers endure due to several factors. Recycling workers in Oakland, no matter how good their protective gear is, still breathe in toxins and risk contamination if they suffer a cut on the job. It would be more comforting to assume that machines simply shake and sort through all this garbage, but despite the automation at recycling centers, workers still often have to sift through garbage by hand. And in Oakland, recycling workers’ jobs are about to get worse as the city has mandated that they dig through garbage to salvage food waste for compost. As Tepperman points out, such a task makes the job even tougher for Oakland’s recycling workers, who at the city’s Davis Street plant earn $12.65 an hour, a salary that makes it almost impossible to live and survive in the Bay Area. In Southern California, organizations including Don't Waste LA have exposed the conditions to which recycling workers are subjected. Contact with rotten food, syringes and chemicals subject workers to a job that is one of the most dangerous in California.